Charles Manson. David Koresh. L. Ron Hubbard. Their names are famous — or rather, infamous — for the control they exerted on their followers. At least one of the men on that list is arguably still exerting a lot of control on the world even after his death. All of these men could be described as cult leaders. But what draws people to cults? And once they’re in, why is it so hard to get out? Related Video: Could You Start a Cult? One way a recruiter might start is by asking a small favor (Benjamin Franklin effect, anyone?). For former cult member Ian Haworth, that favor was simply to fill out a short survey. From there, the recruiter played on his anxiety that he might have a greater purpose in life, asking, “Isn’t it time you considered giving something back to the community instead of taking from it all the time like most people do?” After that, it was simply a matter of making him feel inferior for things like his cigarette habit, along with promising to be able to help him break it. Soon enough, Ian had pledged his money, time, and labor. Ian is quick to point out that the success of the recruiting methods that hemmed him in weren’t due to his lack of willpower or a mental illness. He was perfectly capable of making rational decisions and actually considered himself to be rather incredulous and skeptical. “The easiest people to recruit are ones with alert, questioning minds who want to debate issues with other people,” he told Vice. “You take a strong-willed, strong-minded person and put them into a cult environment and the techniques used will break a person down very, very quickly.” Maybe it’s that strong-mindedness that makes it so easy. Someone used to doubting themselves might be more inclined to realize that a person is attempting to manipulate them. Isolation. Often one of the first demands made of a convert is that they cut off ties with friends and family members. If they aren’t in line with the cult’s vision, they represent a danger to it. Besides keeping potentially positive influences out of the recruit’s life, this has the effect of grounding the recruit’s entire social life in the organization. Obedience. Well, this is a pretty obvious one. Is it even a cult if the leader doesn’t demand absolute obedience? By requiring members to follow a set of rules that might be arbitrary, nonsensical, pointless, or petty, the cult leader instills a reflexive obedience that can later be exploited to get the members to perform harmful and even violent deeds. Labor. Besides the obvious benefit of free labor that the cult reaps by requiring endless work of its members, putting people to work is a great way to keep them from questioning their leaders’ goals and thought processes. You can’t shake off an oppressor if you’re always exhausted. Money. By requiring members to raise money for or donate all of their money to the cause, cults don’t just fund their organization: they also prevent members from having the wherewithal to leave. It’s hard to flee if you can’t even afford a cab. Ostracization. The goal of these onerous demands is to leave members feeling as if the only thing worthwhile is the vision of the leader and the sense of community. But if a person does escape, they might find more purpose on the outside. To combat this, a cult will stigmatize those “apostates” even more than the uninitiated and will equate leaving the cult with failure and persecution. It’s not a coincidence that these demands share many qualities with those made by abusive partners — in both circumstances, an individual is attempting to exert control by manipulating their victim’s sense of self-worth and value. It’s just something that’s worth thinking about. If you think you may be in a cult, here’s a guide on how to leave. For the “German Girls,” as they came to be called—the approximately 50,000 women in Norway who had consorted, or were rumored to have consorted with Nazi soldiers during the country’s occupation, and were later denied jobs, socially shunned, physically attacked or deported because of it—Norwegian prime minister Erna Solberg has issued a formal apology. As the BBC reports, the announcement came at an event this week marking the 70th anniversary of the U.N.’s Declaration of Human Rights. As Emily Sullivan at NPR reports, while trysts between locals and occupying armies are not uncommon during wartime, in Norway the situation was different. The Nazis encouraged soldiers occupying the Nordic nation to have children with local women, part of Heinrich Himmler’s designs to engineer an Aryan super race composed of German and Nordic genetics. It’s estimated that about 12,000 children were born to Norwegian mothers and invading Nazi German soldiers. These children, along with their mothers, faced many forms of discrimination after the war. Women who married German soldiers and their children were stripped of their Norwegian citizenship, interned and deported to Germany. Many of the offspring who remained were abused, attacked and confined to mental institutions because of their parentage. Some, like Anni-Frid Lyngstad, a member of the band ABBA who is the daughter of a German father, fled Norway for Sweden with her mother to escape the rampant persecution. While the Norwegian government issued an apology to the children in 2002 and offered them compensation, it’s taken another 15 years for it to acknowledge the mothers. Magra for the Times reports that this reassessment of history became feasible as the last members of the World War II generation, who considered the women collaborators or traitors, have aged out of political power. Norway was not alone in persecuting “horizontal collaborators,” as these women were crudely called. Violent purges of women occurred in other occupied countries. Take France, for instance. As Ann Mah at TIME reports, following the Allied liberation of the country, the public began attacking women who had entanglements with Nazi soldiers, as part of the center of a larger purge called the épuration sauvage. About 20,000 women accused of sleeping with the enemy had their heads shaved; others were covered in tar, physically assaulted, stoned, spat upon and shunned. As many as 6,000 people considered collaborators, including many women, were killed. n 1952, Bessie Blount boarded a plane from New York to France to give away her life’s work. The 38-year-old inventor planned to hand over to the French military, free of charge, an extraordinary technology that would change lives for disabled veterans of the Second World War: an automatic feeding device. To use it, a person only needed to bite down on a switch, which would deliver a mouthful of food through a spoon-shaped tube. Forget her, however, we cannot. For the second half of her answer has far eclipsed the first: the innovations Blount pioneered on behalf of humanity have marked her indelibly in the historical record. In her long life—she lived to be 95 years old—Blount was a lot of things: nurse, physical therapist, even forensic handwriting expert. But more than anything else, she was an inventor. She dreamed up assistive technologies for people with disabilities, and she constantly reinvented herself, teaching herself how to build new doors when others were closed to her. In 1952, Bessie Blount boarded a plane from New York to France to give away her life’s work. The 38-year-old inventor planned to hand over to the French military, free of charge, an extraordinary technology that would change lives for disabled veterans of the Second World War: an automatic feeding device. To use it, a person only needed to bite down on a switch, which would deliver a mouthful of food through a spoon-shaped tube. Blount was born in Hickory, Virginia in 1914 to George Woodward and Mary Elizabeth Griffin, who had set deep roots in Norfolk. Though a generation apart, both Mary and Bessie attended the same one-room schoolhouse and chapel, Diggs Chapel Elementary School. The school-chapel’s miniscule size belied its significance to the community: it was established at the end of the Civil War to educate the children of free black people, former slaves and Native Americans. It was in this one-room schoolhouse that Blount first learned how to remake herself. She was born left-handed, and she recalled in multiple interviews with journalists how her teacher, Carrie Nimmo, hit her across the knuckles for writing with her left hand. She responded to the teacher’s demands by teaching herself how to write with both hands, her feet—even her teeth. After Blount finished the sixth grade, she took her education upon herself. She had no choice; there were no schools in the area that offered higher education to black children. Eventually, she qualified for college acceptance at Union Junior College in Cranford, New Jersey and nursing training at Community Kennedy Memorial Hospital in Newark, the only hospital owned and run by black people in New Jersey. She went on to take post-graduate courses at Panzer College of Physical Education and Hygiene, now part of Montclair State University. She ultimately became a licensed physiotherapist, and took up a post at the Bronx Hospital in New York City around 1943. In 1941, while Blount was still pursuing her medical education, the United States formally entered World War II. She responded by putting her nursing skills to use as a volunteer with the Red Cross’s Gray Ladies at Base 81, which served servicemen and veterans in the metro New York and northern New Jersey area. Named for the color of their uniforms, the Gray Ladies were meant to be a non-medical group of volunteers who provided hospitality-based services to military hospitals. In actuality, much of their actual hands-on work included facility management, psychiatric care and occupational therapy. Blount’s work with the Gray Ladies brought her in contact with hundreds of injured soldiers overwhelming veteran’s hospitals. “About 14,000 in the army experienced amputation, and survived amputation,” war and disability historian Audra Jennings tells Smithsonian.com. With upper limb amputation, many soldiers lost the ability to write with their hands. So Blount pushed them to learn another way, just as she had many years before—with their feet and teeth. Some even learned to read Braille with their feet. The inspiration for a feeding device came when a physician at the Bronx Hospital told her that the army had been trying to produce a viable self-feeding device but had been unsuccessful. If she really wanted to help disabled veterans, the doctor said, she should figure out a way to help them feed themselves. “It was not surprising to me that the VA did not adopt this new technology,” says Jennings; the VA was largely underprepared to support the number of injured and disabled veterans, and assistive technology just wasn’t there yet. Throughout the war and after, lack of preparation, resource shortages, and lack of action on the federal level to improve conditions for disabled people left veterans and the public with a sense that the VA was not providing veterans with sufficient medical care and rehabilitation. Even the prostheses that the VA provided for amputees were poorly made, often produced for “quantity, not quality,” says Jennings. Despite the U.S. Army’s disinterest in the device, Blount was successful in finding a Canadian company to manufacture it. Eventually, she found a home for it with the French military. “A colored woman is capable of inventing something for the benefit of mankind,” she said in another interview with the Afro-American after the 1952 signing ceremony in France. This device was indeed groundbreaking: Soon following the ceremony, over 20 new patents for assistive devices for people with disabilities, citing Blount, were filed with the U.S. government. Blount was not yet done inventing, however. As she continued to teach writing skills to veterans and others with disabilities, she began to pay attention to how handwriting reflected a person’s changing state of physical health. In 1968, Blount published a technical paper on her observations titled “Medical Graphology,” marking her transition into a new career in which she quickly excelled. Spurred on, Blount worked for five years to create a device that would do just that. Turning her kitchen into her workshop, she spent ten months designing a device for those who had either underwent upper limb amputation or paralysis. Then, she spent four more years and a total of $3,000 of her own money to build it. Her creation would shut off automatically after each bite, so that the individual could control their own feeding. 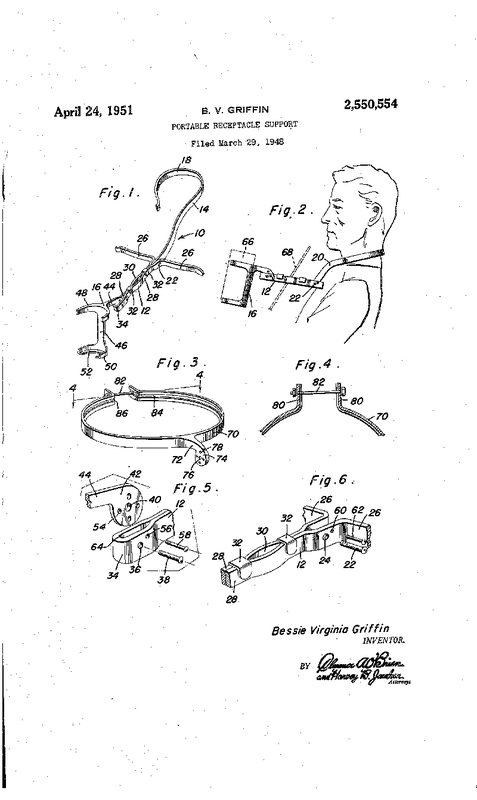 She also designed and build a non-automatic food receptacle support, for which she received a U.S. patent, that affixed to an individual’s neck and could hold a dish or cup. “I usually worked from 1 a.m. to 4 a.m.,” she told the Afro-American. After the publication of her paper, she began consulting with the Vineland Police Department, where she applied her observations on handwriting and health to examining handwritten documents to detect forgeries. By 1972, she had become the chief document examiner at the Portsmouth police department; in 1976, she applied for at the FBI. When they turned her down, she again turned her sights overseas, finding a temporary home for her talents at Scotland Yard. In 1977, at 63 years old, she began training in the Document Division of the Metropolitan Police Forensic Science Laboratory, making her the first black woman to do so. When Blount returned to the states, she went into business for herself. She continued to work with police departments as an expert handwriting consultant and was active in law enforcement organizations like the International Association of Forensic Sciences and the National Organization of Black Law Enforcement Executives. She offered her expertise in handwriting to museums and historians by reading, interpreting and determining the authenticity of historical documents, including Native American treaties and papers relating to the slave trade and the Civil War. In 2008, Blount returned to that one-room schoolhouse where it all began. She found nothing left of it but some burned down ruins. Given how much history the site held—both her own and that of black children after the Civil War—Blount had planned to build a library and museum. “There’s no reason these things should be lost from history,” she said. Unfortunately, before she could see her plans come to fruition, she died in 2009—but her memory lives on in her remarkable life story, her innovative patent designs and the descendants of her signature invention.